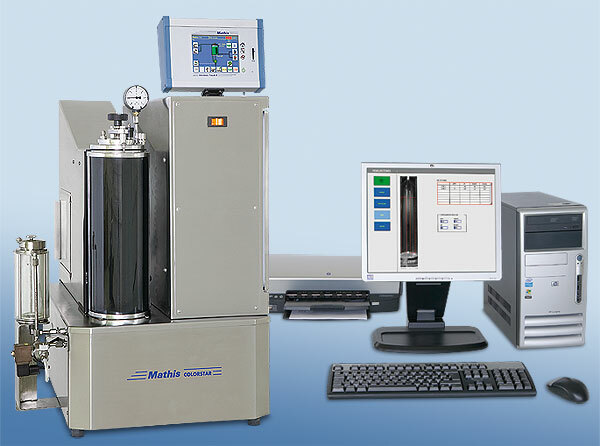 CF COLORSTAR FOAMY type В«CFВ», The Colorstar Foamy type В«CFВ» has the same basic design as the Colorstart type В«CJВ», but the liquor does not circulate through the dye sample but is discharged through a special nozzle where foam is generated in the gl, Mathis AG :: Worldwide competence in dyeing and coating; Plant and mechanical engineering in the dyeing and coating sectors for standard laboratory and production equipment and customized system solutions. The Colorstar Foamy type В«CFВ» has the same basic design as the Colorstart type В«CJВ», but the liquor does not circulate through the dye sample but is discharged through a special nozzle where foam is generated in the glass container. The formation of foam and its following destruction after the addition of chemicals can be observed optically and evaluated together with the corresponding temperature curve. The formation of foam can be observed by means of the automatic foam height evaluation system В«FoamTronВ». A camera signals images and data to a PC. The change in the foam images can be observed online on the PC and the corresponding data displayed.